On February 13, an Italian court sentenced Swiss businessman Stephan Schmidheiny and Belgian Baron Jean-Louis Marie Ghislain de Cartier to 16 years imprisonment. They were found guilty for negligent behavior in exposing Eternit’s workers and citizens to asbestos. In the mass civil action trial, some 6,000 people were seeking damages over the deaths of some 3,000 people who worked at or lived near Eternit’s plants in Italy. The story of Stephan Schmidheiny is quite interesting, not least in showing why a big fight for environmental justice is really urgently needed. As member of an important Swiss industrial dynasty, Schmidheiny inherited Eternit and was named CEO of the Swiss Eternit Group in 1976. Only in 1986 he ended the company´s use of asbestos, after he described it as ‘no longer profitable’. Since at least 1946, scientific studies had shown the deadly consequences of exposure to asbestos, leading several countries to ban asbestos long before 1976. There were documents back in 1950 showing that Eternit Enterprises and the Schmidheiny family were aware of asbestos being a lethal material. More surprising than his conviction, is how he later became a prominent and dominant champion of sustainability. In 1990 he was appointed chief adviser for business and industry to the secretary general of the United Nations Conference on Environment and Development (UNCED), the Rio de Janeiro Earth Summit of 1992. He created a forum in which leading businessmen from all parts of the world developed a business perspective on environment and development challenges. This forum later became the World Business Council for Sustainable Development (WBCSD), an organization that today counts the world’s 160 most important companies as its members. Stephan Schmidheiny was elected Honorary Chairman. In brief, this person is very renowned and respected in the green capitalism sector. He received a great number of prizes and distinctions in acknowledgment of his leadership in promoting eco-efficiency. But the Italian lawyers did not buy the argument of the defense that this makes up for any past misdeeds. That is the bottom line of this story. 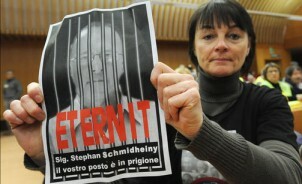 It remains unclear if justice will ever be done, as Stephan Schmidheiny is still a free person living in Switserland and Costa Rica and going to use all appeals possible. But let the message to any CEO in charge of any lethal or ill-making production process that they choose to continue at the behest of profits be clear: you have a moral and a legal obligation to halt or alter that process immediately and if you don’t, the global movement for environmental justice is going to fight against you until at least some justice is done. The trial in Italy was made possible through intense community mobilization, the support of environmental justice organizations and dozens of brave witnesses. Even then, a 16 year sentence and some 30.000 euro compensation per family is not much to bring justice. “This trial will go down in history… but it will not bring my dad back,” said Piero Ferraris, whose father Evasio died in 1988 of lung cancer after working in a local Eternit factory from 1946 to 1979.